Departure 1730 p.m - 2030 p.m.
Catch Kota Kinabalu City at its most affable. Take a ride down to Tanjung Aru Beach for the sunset and wander through the food stalls here. Go through to Pasar Malam at Segama in the city. 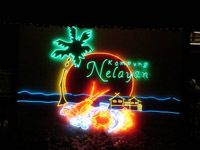 Enjoying a seafood dinner at Kampung Nelayan Seafood Restaurant and enjoy their spectacular Cultural Show of the insight highlight to the wonderful Sabah many ethnic groups.